* Translate physical/tactile manipulation into a mental model of the periodic table. * Learn the names of the chemical groups and basic categories of elements. * Learn the layout of the periodic table. * Learn how groups are built from elements with similar chemical behaviors. * Learn how periods are built by elements which progressively get heavier. Although there are over a hundred different elements, they don’t have random properties, and there’s no need to use raw memorization. We can look at how elements behave. When we find their patterns they offer a natural way to understand and organize them. Let’s start off with an analogy a pattern that we find in music. How are elements arranged like piano keys? The eight-note interval between any two notes on a keyboard with the same name is an octave. The sounds of musical notes that are separated by an octave are related, but they are not identical. In a similar way, elements in the same column of the periodic table are related but not identical. The periodic table is organized as a grid. Each element is placed in a specific location because of its atomic structure. 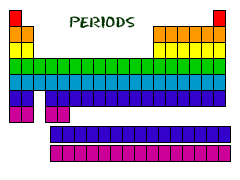 The periodic table has rows (periods) and columns (groups). Rows read from left to right. Each row is called a period. All of the elements in a period have the same number of atomic orbitals. We’ll learn about orbitals later. Vertical columns are called groups. Elements in each group have the same number of electrons in the outer orbital. What does that mean? Elements in each group have the same # of e- available to share. Basic idea: Some electrons are tightly bound to the atom. They stay stuck to it. But other electrons are only loosely bound to the atom – they can easily be pulled away and shared with other atoms. These loosely held, outer electrons are valence electrons. Valence e- are the only electrons involved in chemical bonds with other elements. 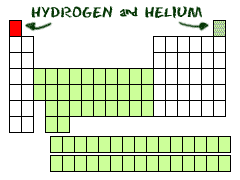 Helium (He) is different from all of the other elements. It is very stable with only two electrons in its outer orbital (valence shell). Even though He only has two, it is still grouped with the noble gases that have eight electrons in their outermost orbitals. The noble gases and helium are all “happy,” because their valence shell is full. HS-PS1-1. Use the periodic table as a model to predict the relative properties of main group elements, including ionization energy and relative sizes of atoms and ions, based on the patterns of electrons in the outermost energy level of each element. Use the patterns of valence electron configurations, core charge, and Coulomb’s law to explain and predict general trends in ionization energies, relative sizes of atoms and ions, and reactivity of pure elements. Students understand that the periodic table is an organizational tool that can be used for the prediction and classification of the trends and properties of elements. C-PE.2.1.1 Predict, based on its position in the periodic table, the properties of a given main group element. Properties include appearance, electronegativity, type of bond formed, and ionic charge. Make a claim about the type (metal, nonmetal, metalloid) of the given element. Give examples of other elements that would have similar properties, and explain why they would have similar properties. Properties of an element can be predicted based on its placement in the periodic table. 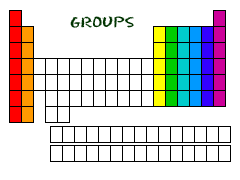 Groups of elements exhibit similar properties with predictable variations; rows of elements have predictable trends.